The first thing, I would like to share to you is "We did not learn technologies, we learn how to use technologies for our business". Purpose of series of articles will introduce you how did I organise the project for those types of application. There are many mistake and improvements need to be done so far. Client: this is client code written by typescript using angular2 framework. Api: this is server side code where handles request from client. 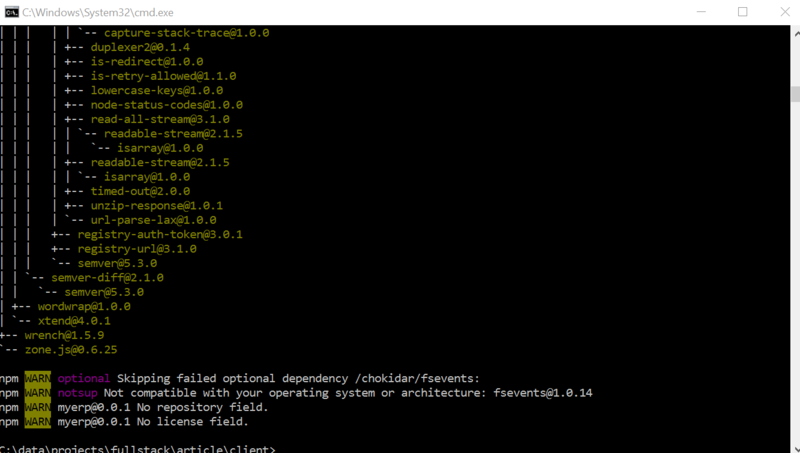 - Type “npm install” for installing missing nodejs packages. 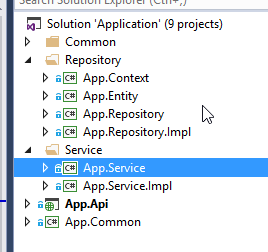 - Open Api project in visual studio (2015). Config the default route, will remove this error page. In this section, we will go through how we implement new page using my code. Listing out The steps we need to do to complete the page. Figure out the missing information, so we can ask for help immediatedly. Think about the flow of logic from the client to server side, from UI to repository. So the written code will be nicer. For this, many of my co-workers, they try to write the code first, and debug it after that. When something wrong, it changes your behavior, and we try to change the code to make it works. this may break the logic flow and the code is not follow the convention, architecture was used in the app. This will raise some new potential issues in the future and the code is hard for manteance. 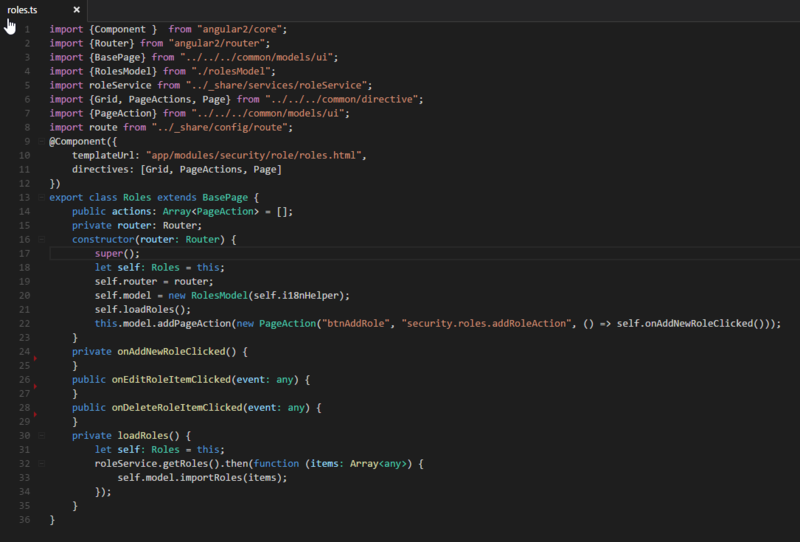 + Create new module (called security), I will discusss more pros and cons on how to modular the application. + Import and register this setting module with application config. + Create component files (html file for UI, ts file for logic handling and ts for view model of that component). + Implement service for this page (service willmake the call to REST api for getting the list of permission). + Add new controller called RolesController for handling request related to Role. + Add entity into appropriated DbContext. Ok, Now we will go through step by step in detail. In this section, <root> folder is the folder of client code (the path to "client" folder). Register route for Roles component (page in angular was called component) and appropriated menu item information (sub menu on th eleft panel). Add this line into the module.ts file created in above step. Import and register this setting module with application config. This will register the security module in the application, show the module and its sub menu items will be displayed on the left panel. The sytem will auto register routes in security module for us automaticly. Create component files (html file for UI, ts file for logic handling and ts for view model of that component). Implemnet the UI of Roles component, there are some directives already created, we use in this article. I will explain more detail in other article how to implement those directives in other articles. "grid" directive, for displaying the list of roles. there are some events we can passnig the handlers and columns of grid in mode.options property. page, page-header, page-content directives, this is the structure of the page in my framework. Specify the template file for the component (line 9). 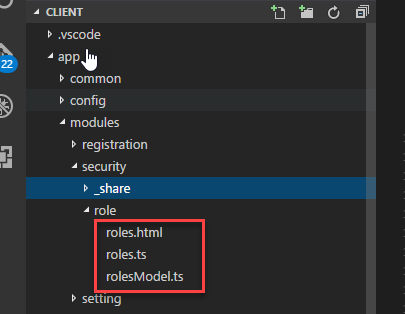 Declare new Roles class inherit from BasePage. Declare the model for the component. each component should have its own view model, this help us reducing the complexity of roles.ts file. Getting data from api by calling appropriated method of roleService. We move this to service and let the roles.ts focus on the behavior of the page. Note: we pass i18nHelper into constructor of RolesModel. this will be used for resolving the lable of grid columns base on the current languages (multi-language supported). Implement service for this page (service willmake the call to REST api for getting the list of permission). In this section, <root> folder is the folder of api code (the path to "api" folder). App.Api: this is public REST api that client side can call. App.Service: this contains all service interfaces and its appropriated DTOs. App.Service.Impl: this only contains implementation of appropriated interface in App.Service. App.Repository: this contains all repository interfaces. Each repository only operates on 1 entity in database. App.Repository.Impl: this only contains implementation of appropriated interface in App.Resitory. App.Entity: This contains all entities of the app. App.Context: Currently, this containts the all DbContexts in the app, as we use EF framework. I intend to merge this with the App.Entity in the future. Note: The communication between the layer (such as: App.Api -> App.Service => App.Repository), we use the interface only. Add new controller called RolesController for handling request related to Role. I think the code is rather simple. From controller we call "GetRoles" of the appropriated service interface and get the list of roles (dto). IoC will return the concrete instance of that service. In App.Service.Impl, we have boostrap.cs file, this is the place for registering the service interface and its concrete implementation. We should define appropriate DTOs for each action, as most cases, we just get some properties of entity and this will help the code easier for mantaince in future. Note: The same as RoleService, RoleRepository class also was delared as internal. So only the interface can be used outside of this project. In this article, I provider you an overview about how to get the list of roles and display them on the ui. In next article, we continue with how to create and update roles, and go into more detail of framework (such as: project structure, directives, ....). Thanks for sharing awesome tutorial. Similary many issues are there. Please help me to check your code and make sure that the code is from develop branch. Hey! I merely wish to give an enormous thumbs up for the great info you�ve got here on this post. I will likely be coming back to your blog for much more soon. Could you please contact me on skype, I will support you more. There may be missing script. Please add these from index file or remove. as we did not user it. Hey hii, great tutorial. I could not find your project on GitHub, its showing 404 error. Please share updated link. Keep it up & Thanks.